As far as my children are concerned I have just taken on the most amazing job in the world...Queen of the World if you will. It has given me amazing cred with them (does anyone say cred anymore?). What is this fabulousness that has entered our lives? 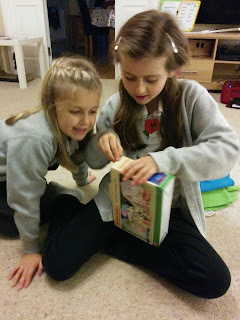 I am a new blogger for Friends of Sylvanian Families! My sproglets LOVE Sylvanian Families - I kid you not... we have tons of the stuff. Literally. This is no exaggeration. Sylvanian Families has recently celebrated its 30th Birthday and so I am (just) old enough to remember them from my school days. I vividly remember one girl when I was around 6-7 years of age who collected them and she used to sneek them in to school but it was never something I was in to or collected. 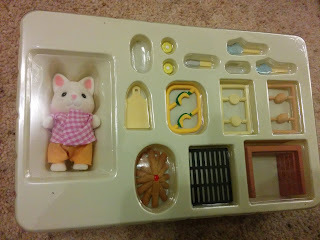 In an attempt to wind back the clock and relive the toys of my youth when Miss R turned 4 I decided that I would start collecting them for her and so it began. That Christmas Santa brought her Lakeside Lodge and a family from us and we asked other rellies to buy her bits of furniture etc for the house. 4 years later and we now have houses, hotels, restaurants, cars, boats and campers along with various families and the odd waif and stray - so you can see why they would be excited! 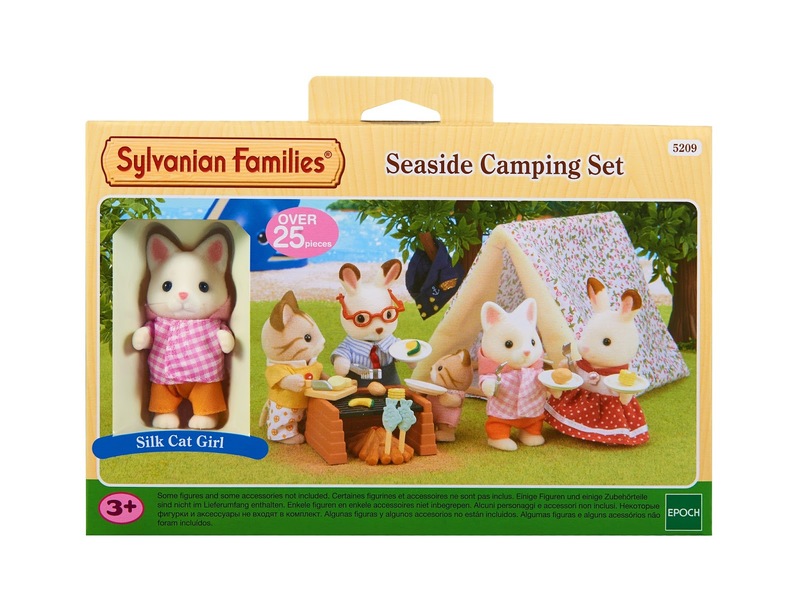 I have been sent the Seaside Camping Set to review. 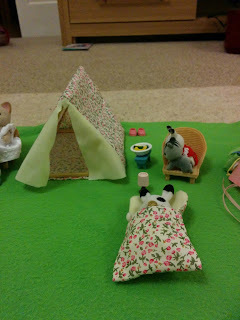 When the sun is shining bright and work and school is on hold for the holidays, the Sylvanian occupants love nothing more than camping outdoors in the wilderness. This charming set features a stylish floral tent and sleeping bag, cutlery and crockery, and a toasty log fueled fire to rustle up a delicious snack with the nutritious food provided. Tiffany, also included, cannot wait to embark on her next camping adventure. 1 Silk Cat girl; 1 grill; 1 oven; 1 tent; 2 grilled fish; 1 firewood; 1 cutting board; 1 knife; 1 tong; 4 plate; 4 fork; 2 onion: 2 corn; 2 pumpkin; 2 potato; 1 sleeping bag. Despite the image on the front the set only comes with one character but when I asked my girls how many characters came with the set from looking at the box they said 1 - so all was fine there! Sylvanian Families have recently changed their packaging away from the blue to this more vintage look. I like it a lot but the children thought it looked 'old'. Perhaps that's why I like it! Reverse view of box so you can see whats included. I waited for the girls to get home from school so they could open it up. 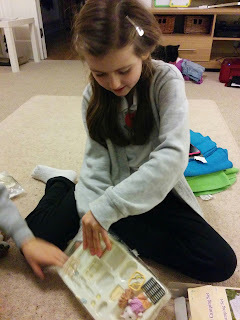 I wanted to see what they thought of it AND how easy it is for little hands to open and put together. 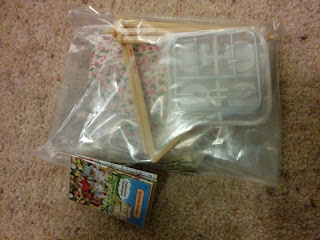 The packaging wasn't excessively large for the size of what's inside. They were keen to open everything up. Little Miss L just likes to get the figure and get playing but Miss R does like to put everything together. 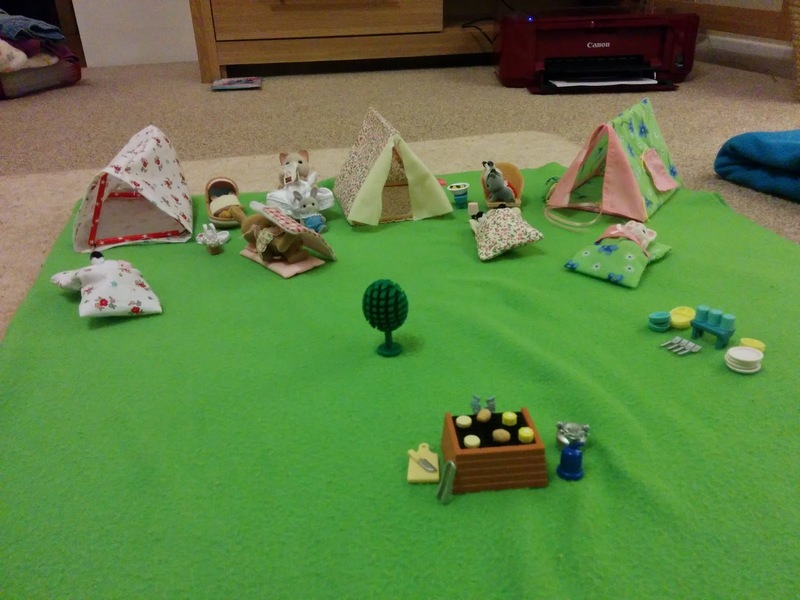 She found the tent a little stiff to click in tightly but it was easy for her to assemble and get playing. 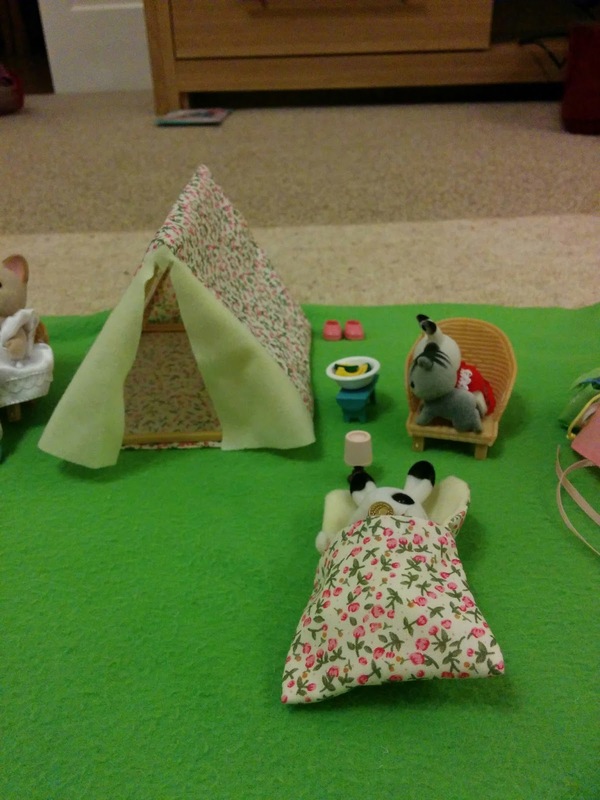 As will all Sylvanian Families products the attention to detail is amazing. The teeny tiny food and knife are so detailed (AND easy to lose!). 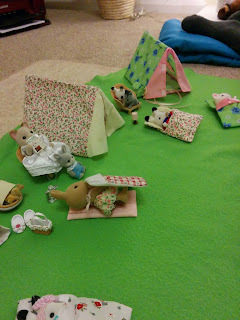 The girls were quick to get the other Sylvanian Families tent they have from Ingrid's Camping Set and the home made tent from a straw/wire combo and set up camp! Miss R pointed out that this tent doesn't have the ties to be able to tie open the front of the tent. I actually don't think this is a bad thing as they are so fiddly to tie anyway that nothing is lost by not having the. This tent is also missing the 'window' from the side. 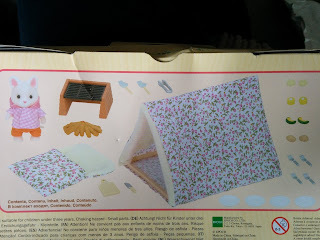 The ditsy floral fabric print is really cute and perfectly proportioned for the size of the tent and the sleeping bag. The food items my girls thought were water melon, jacket potatoes and biscuits rather than pumpkin, onion, potatoes and corn - perhaps that's because in the UK we tend to associate pumpkins purely with carving for halloween and not a campfire food. 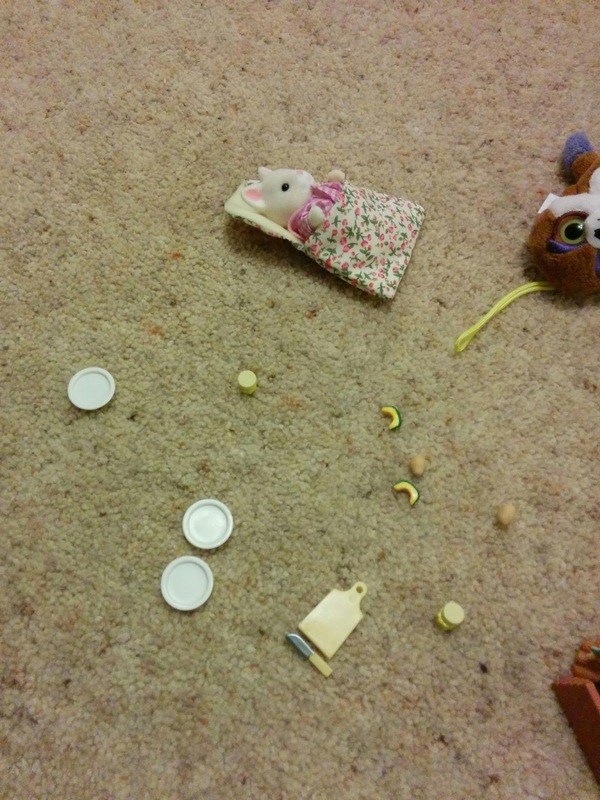 How long until we have lost some of those tiny food items or they have been eaten by the cat! 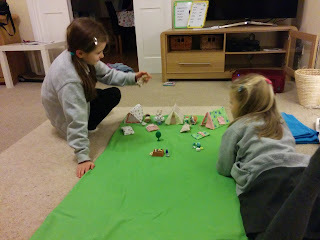 A campsite emerges in the lounge! And that was the girls lost for the next hour, happily ensconced in playing with their new set. For me the set itself is lovely - its the packaging I would change. 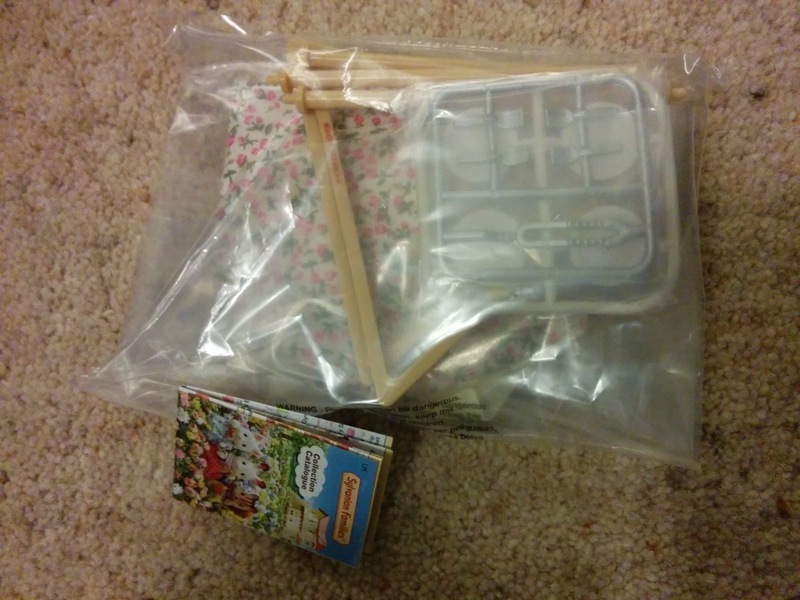 I hate to see items in those plastic trays and wonder if they wouldn't be better inside a cardboard tray in like an egg box cardboard. I'm sure it comes down to price but I would hope that that is something the manufacturers would look into in the future. 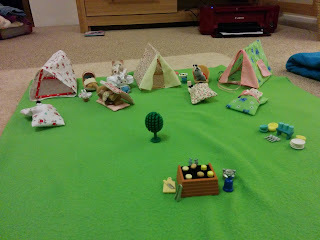 When asked if they felt anything was 'missing' from the set Miss R felt it should come with a bucket and spade (since its a Seaside Camping Set) and Little Miss L thought it should come with a fishing rod (I assume she has some gnome genes in her somewhere!) otherwise it was totally a thumbs up from the Holiday girls! Have you got this set? Let me know what you think of it in the comments. NB/ All opinions are my own. I have not been paid for this review although the product was supplied to me for review purposes. Where is the best place to buy them, your cousins girls want them, want them, want them, need them a lot, got to have them but would wait until Christmas, JUST. Rxxx PS I like your review style.